Picture a pristine valley with no lifts, no marked trails and no huts. Throw in the best guidebook ever produced, plus a super-detailed map of ski tours, and you’ve found backcountry heaven. As if that wasn’t enough, this is in the Italian Piedmont – so great food and wine are an essential feature of every superlative day tour. Welcome to Val Maira! Val Maira is a little known valley in the southern Italian Alps. It’s nestled in that bulge on the Italian/French border, about 100 miles south-west of Turin. If, like me, you navigate via ski resorts and national parks, then Val Maira is just south of Monte Viso, with the Queyras National Park over the border to the north-west. Easy skins, descents as steep as you like and all a doddle to get to. What’s not to love? To the south-west is the Mercantour National Park, and we are to the north of Isola 2000 on the main Alpine frontier chain. This means snow conditions are remarkably reliable, with a wacky micro-climate dumping plentiful powder throughout early winter. 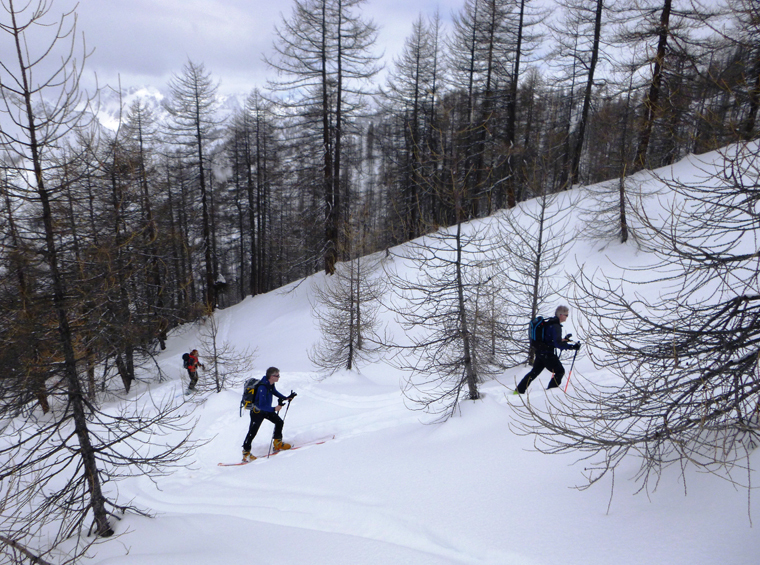 Val Maira is a ski touring, day touring paradise. It’s well loved by the locals, who decided many years ago to keep it free of lifts and mechanical infrastructure. Hence this relatively undeveloped and unspoilt valley offers a pristine charm as well as world-class Italian hospitality and cuisine. In terms of terrain, Val Maira is a long, curving valley, running mostly east-west for 45km before curving north to the end. There are numerous side valleys that shoot off the main feature, all adding up to provide a plethora of ski touring options on every aspect. With the valley floor at 1000 to 1600 metres above sea level, and the summits ranging from 2300m to 3400m, the valley is the perfect scale for day tours. Typical days out will involve at least 1000m of skinning, but if you play your cards right you can usually ensure a greater descent by choosing a linear trip from a high starting point to a lower pick-up at the end of the day. Within this relatively small corner of the Alps you can find almost every type of terrain imaginable. 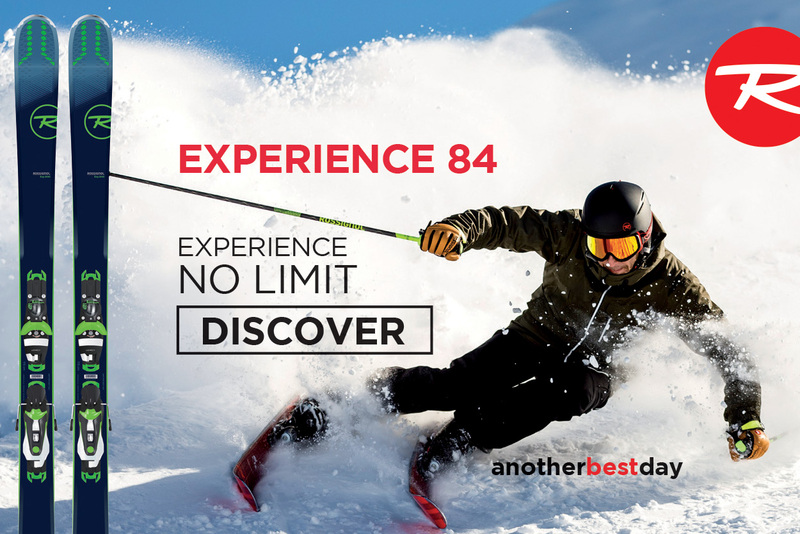 Wide open slopes offer amazing spring snow to the north of Elva and Acceglio, and the major peaks of the frontier ridge supply everything from classic couloirs to exposed ridges. You want it steep? You got it – as steep as you like in the dramatic peaks of the main range. But if the snow keeps falling and the avalanche risk mounts up, you can always find easy-angled tree skiing as high as 2500m. So there is always something safe and enjoyable to do, whatever the weather gods throw at you. As if this wasn’t good enough, a local legend named Bruno Rosano has made it his life’s work to curate and photograph the routes and compile them in an excellent guidebook. Charamaio mai en Val Maira is a true labour of love, and the finest ski touring guide I’ve read. It’s only available in Italian, but with photos, illustrations and details this good, it hardly matters. Furthermore, it is complemented by a superb annotated map, Esquiar en Val Maira, which gives you a lifetime’s worth of information in one magnificent 1:20,000 sheet. At the time of writing, these are readily available in the valley but not so easy to pick up in the UK. Worry not – don’t bother with any of the maps you can buy online; wait until you get there to savour the real thing. The season runs from the first snows in January until mid-April, depending on the year. There are no glaciers in Val Maira, so no need to wait for late season touring or consolidated snow. In fact, many of the slopes are alpine pastures and grassy meadows; so if there is snow, you can go. While the summits are not super-high, the tree line goes up to 2500m in places, giving shade, shelter and visibility in even the poorest conditions. There is always something to go at throughout the season, but late February has become the optimal time. With so many options of all altitudes and aspects, every week will have its own character and take you places you have never been before. Just go with an open mind, prepared to react to the conditions as you find them. It is a doddle to get to Val Maira, with a short transfer from Milan or Turin airports. Turin is the best bet; car hire is cheap (this being Italy) and will see you settled in the valley inside two hours. For those on public transport there is a great train service from Turin to Cuneo. From Cuneo, there is a limited (but cheap and efficient) bus service up the valley twice a day. Once in the valley, there are a number of taxis offering a shuttle service with mini-buses and ski racks. Even if you bring your own vehicle the shuttle buses allow you to do linear trips from one place to another, making the most of the conditions as you find them by taking the optimal descent on the day and getting a lift home when you’re done. Even better, you will usually find a bar at the road head for a cheeky Peroni or Aperol. There are a number of options, depending on your appetite, your budget, or where in the valley you want to be. Groups often stay in the Pensione Ceaglio (ceaglio-vallemaira.it) in Marmora. It’s a popular base with oodles of charm and great hosting by the Fulvia family, but is a little out of the way. My favourite is to stay with Alessandro Bolfi at the Hotel Londra (hotel-londra.eu) in Acceglio – the village at the heart of the action. Ale is a great host with a passion for the mountains and an intimate knowledge of the ideal routes and conditions for every day. He might look like an archetypal cheery Italian hotelier, but in his time he has skied everything in the valley. 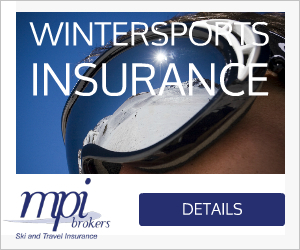 His knowledge of the skiing is only trumped by his knowledge of local wine and grappa. Every night in the Londra finishes with a fine espresso and ‘grappa time’ before some parting gem of a plan for the next day. The hotel is more basic than some, but offers great value, spacious rooms, great drying room facilities and a sauna in the attic. 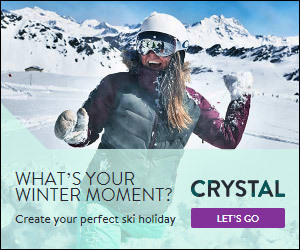 But anyone with experience of skiing in Italy will know that it’s really all about the dining room, and a fantastic Piedmont buffet awaits guests every evening. Which are the classic tours? of the area is Punta La Piovosa, which offers a number of routes, including visibility-assured tree skiing on easy angled west-facing slopes. If the weather is good, then keep going for the lofty summit of Punta Tempesta. But be aware that the clue is in the name; this peak is often ravaged by wind. To the north, you can find a stunning open bowl of slopes above the hamlet of Elva. This area is prime for easy angled, early season skiing as the slopes are gentle and face south to south-west. 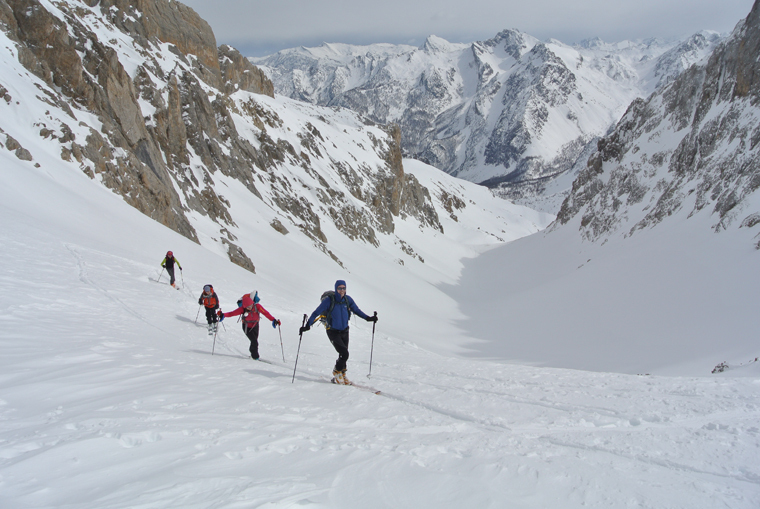 The peaks above Elva also offer a modest warm-up as the summits can be reached in just 600m of skinning. This allows time for several laps, several summits, or head further east for the bigger peaks. Monte Cugulet gives 1000m metres of the same aspect as the Elva peaks. If the conditions allow, a steeper descent to Langra in the south gives you 1500m of skiing for just 1000m of uphill effort. The main event in the valley is undoubtedly the bustling hamlet of Chialvetta. This is a starting point for a huge number of routes and gives you the best range of options on a day when you just cannot decide. SImply set off and let the conditions dictate where to go. There are hundreds of routes that start here so you are unlikely to be alone. Thankfully, most folks go for the classic peaks of Bric Cassin and Monte Vanclava. 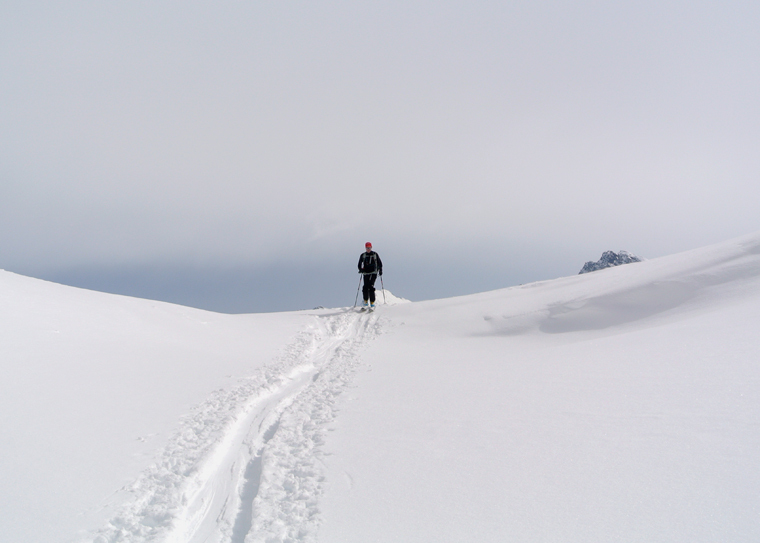 But we are going to head for the quieter summits of Soleglio Bue for fresh powder, or Bric Boscasso. This is every bit as classic as the others, with a well tracked line through the trees to gain the upper bowl and stunning summit ridge. If conditions allow, traverse further south into the Cumbal Vallonetto to gain a less frequented descent on steeper terrain. It doesn’t all have to be about summits. From the same starting point in Chialvetta, a traverse of the Col d’Enchiausa is as good a day out touring as any you will find. A long mellow ascent up the Valle Enchiausa leads to the stunning col and amazing vistas. From there a long and complex 1200m descent leads you through bowls, valleys, past lakes and through trees down to the bar at Saretto to wait for your shuttle. Even better, you are sure to spy a hundred routes you want to go back for in the future. It’s a great way to get to know the valley. and optional descents as steep as you like. Cruise up the main skinning line, spy the conditions as you go, and choose the gradient for the way down as the conditions dictate. Winner! At the head of the valley, above Chiaperra, the terrain starts to feel much more rugged and wild. From here, the quintessential peaks of Monte Eighier, Mont Cervet and Monte Freide come into reach. These are great days out and feel longer and more serious than lower down the valley. For the more adventurous, this end of the valley gives access to the Aiguille Chambeyron and a number of high alpine refuges. By crossing into France, it is possible to make some superlative tours later in the season, so long as the snow holds up on these south-facing slopes. You are unlikely to find any other people this far up the valley and the only tracks will be those of the local bouquetins.